nick heyward is really the only name i recall, and even that took several kilometres of thought process. intriguing how i can remember the lyrics from many a song of the seventies yet others, including band personnel, escape me completely. it was heyward and les nemes from the oddly named moving england who apparently teamed up with guitarist graham jones to form the even more oddly named haircut one hundred, something of an anathema to yours truly in light of my several decades avoiding anything like a haircut. in fact, only just the other week, my editor was wont to point out that, when he were a little lad, the occasion of going for a haircut mostly led to the barber placing a board across the arms of the chair, bringing him to the correct height for both scissors and mirror. up until that point, i had completely forgotten about such an arcane process, one that i too had undergone when sent to get a short back and sides before i knew any better. those days are now long gone, but i wonder whether there are barbers' shops where the same rite of passage still occurs? at any rate, being able to sit in the chair rather than on the board was considered the point at which one graduated from mere childhood to apprentice adult. as to haircut 100, i doubt i've had that many in number since the mid-nineties. but, continuing the theme of odd names, not only of bands but also of song and album titles. their debut album was entitled pelican west, arriving only after they had appeared in the charts with the first single; favourite shirts (boy meets girl). while many of you might think neither single or album are apportioned particularly eccentric titles, it has always dogged me since its appearance that anyone would actually have a favourite shirt, or even a collection of same. a favourite bicycle i can completely comprehend and possibly even a favourite cycle helmet (though the jury is out on that one) but my life has not yet approached the need of recognising ownership of a favourite shirt. i have quite a number of baselayers, both short and long-sleeve, predominantly fashioned from merino wool. if one is allowed to have a favourite fabric, merino would be it, but i think i share that with a sizeable number of cyclists. however, the latest offering from perren street has pretty much succeeded in combining the mesh quality of their pro-team baselayer and the more regular merino version. 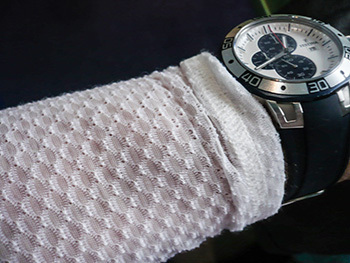 it's composed of a 70% polyester/30% merino blend, knitted into a warmth inducing mesh that stretches from the collar all the way to the cuff of each long-sleeve. 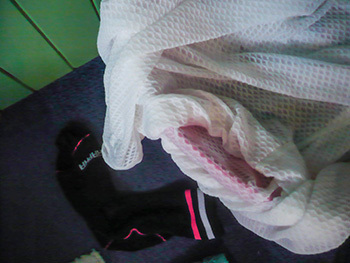 ironically it seems to have less physical presence than mrs washingmachinepost's kitchen roll with which i wiped many of the puddles of water left in a trail across the kitchen floor after re-enacting the movie from rapha's autumn/winter lookbook on the sunday morning ride. it was the sort of bike ride that elicited several queries regarding our collective sanity on stepping bedraggled into debbie's just prior to lunchtime. rarely has a froth-topped cup of cappuccino been so welcome. however, though well protected by a long-sleeve jersey and a rapha race cape, that lightweight mesh provides the ideal balance between the pro-team and the regular long-sleeve merino baselayer, and the fit is, to coin a phrase, quite exemplary. yet despite its lightweight constitution, winter days are its true habitat; so much so, it appears, that it is now my favourite shirt. i'm sure nick heyward would agree. rapha's merino mesh baselayer is available in either cream or black, as a short sleeve (£55) or long-sleeve (£60). sizing reaches from xxs to xl throughout the range.